Ohhh yum, have you ever tried this stuff? We got hooked when we were living in Ecuador. It is easy to make too, I made a whole load when I came back from Ecuador by boiling the cans of condensed milk, but it is rather dangerous and takes about 3 hours. THEN the other day, I found a much easier way to make it. Pour the condensed milk into the bowl, cook on 600w for 5 minutes, keep an eye on it, it will bubble up and if you're not careful make a right mess of your microwave. Whisk for a minute, return to oven, cook in spates of 2 minutes at 500w, each time, give it another whisk. You will notice it getting thicker, when you get as thick as you like it, stop and allow to cool. I cooked mine for about 15 minutes or so. Spoon into a jar. Don't worry about it going off, it won't last that long LOL. Enjoy on freshly baked bread, also good on ice-cream. How do you eat yours? Ooohhhh, dulce de leche is the yummiest! thanks for your recipe! yum. sounds very interesting. i'll have to give it a try. i'm not sure how to use our microwave, though. it only speaks German. i just push the same button every time and it seems to work, but i don't know how to change temperatures. if you have a sec could you give stove top directions? i honestly have never heard of doing anything like this with sweeten cond. milk. I will have to try it. Katy, put the tin a a pan of water and bring to the boil, you need to boil it for 2-3 hours, the longer you boil it the thicker it will be. DO NOT let the pan run dry. i read some recipes (can you actually call this a recipe?) that said to piece the top of the can, I didn't when I did it. Let the can cool COMPLETLY - overnight is a good idea before opening it. If you really must open it early then put a tea towel over the can and make sure your hands are covered too. My friend used the boiled can method and the milk exploded out, hitting her hands and face, she had a nasty scar on her face for about a year, it cleared up eventually. Oooohhh! Hmmmmm!!! Thanks for the microwave method I've been longing for some home made dulce de leche for a long time. Here (Italy) I cannot find condensed milk in tins anymore, only jars or tubes. I've always boiled the tin in water for 21/2 - 3 hours (I like it thick) making sure the tin is covered in water. I have never pierced the can and ALWAYS let it cool down before opening it (put it in the fridge if you cannot wait)otherwise it will blow up and is very dangerous. You´ll need 1 can of condensed milk, and a pot of water. Just place the unopened can inside the pot, cover with water, and let it boil for 2 hours (slow), and then let it cool COMPLETELY before removing it from the pot, and opening the can. 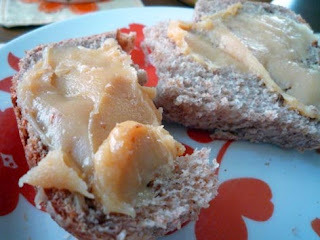 The real dulce de leche has a bright brown color (like caramel), and you can use it on toasts and as cake fillings. We're doing this tomorrow!! I had dulce de leche in Argentina - so good! A mom wanting to pass on her wisdom gave us a caramel pie recipe. It was basically condensed milk boiled in a crockpot (in the can) and then dumped into a graham cracker pie shell. One of my absolute favorite desserts! Katy - I hope you bought more than one can!